Automaker downgrades future earnings forecast. Nissan is taking an $83.2 million charge against earnings due to the scandal surrounding Carlos Ghosn. Nissan Motor Co. warned that its earnings for the fiscal year ending March 31, could be about the lowest the carmaker has seen in six years. Nissan now expects to earn 410 billion yen, or $3.7 billion, for the fiscal year, a 45% year-over-year decline. It originally projected a 500 billion yen, or $4.5 billion profit. The second-largest of the Japanese automakers put most of the blame on sliding sales in the U.S. and China, its two largest markets. 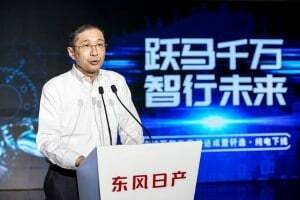 But it also revealed that it has logged an $83.2 million charge related to the scandal that began with the arrest last November of its former Chairman Carlos Ghosn. The Ghosn affair has raised numerous concerns about the future of the Renault-Nissan Mitsubishi Alliance that the 64-year-old executive had helped craft during the past two decades. Jean-Dominique Senard, the new chairman of the French automaker, will visit Japan later this week for a series of meetings with Nissan CEO Hiroto Saikawa and other executives. Following Ghosn’s Nov. 19 arrest, both Nissan and smaller Japanese automaker Mitsubishi quickly moved to fire him. But even though the Brazilian-born executive has been held in solitary conferment at the Tokyo Detention Center, he remained on the Renault payroll until Jan. 24, when he agreed to resign. Nissan CEO Hiroto Saikawa told the media recently that Nissan and Renault officials are trying to build "trust." 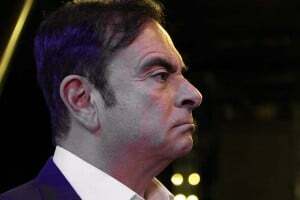 Senard had been running French tiremaker Michelin when tapped to take over as Nissan chairman last month. 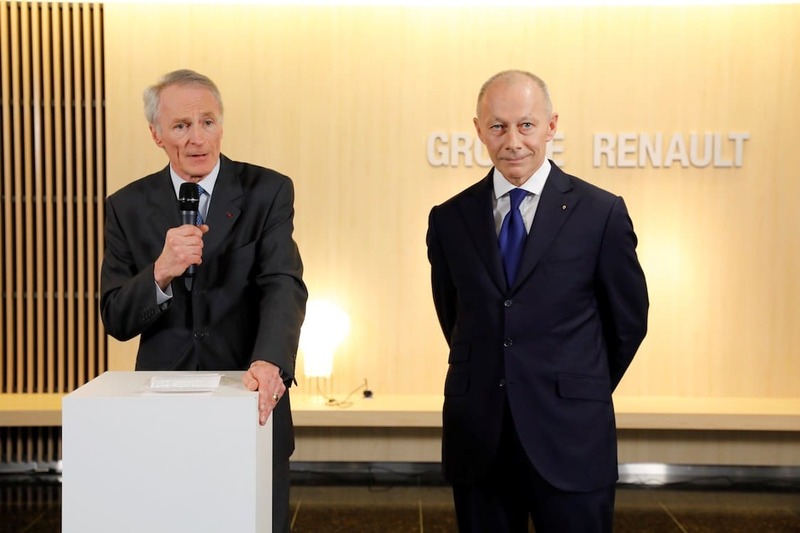 Thierry Bollore, a long-time lieutenant of Ghosn’s was named Renault’s new CEO. Ghosn’s arrest followed an internal investigation at Nissan that discovered alleged financial corruption by the former executive and his colleague Greg Kelly. Kelly was released on bail on Christmas Day, but prosecutors in Tokyo have successfully argued that Ghosn would pose a flight risk and potentially try to tamper with evidence, the courts repeatedly declining his request for bail. The case has generated widespread skepticism, critics questioning whether the case was based more on Nissan’s desire to reshape its relationship with Renault than on any real evidence of corruption on Ghosn’s part. Though substantially smaller than its Japanese partner, Renault holds a 43.5% stake in Nissan which, in turn, holds just 15% of the French carmaker’s equity. That has allowed Renault to unilaterally appoint board members and other senior executives, something Saikawa is believed to be seeking to change. There have been several high-level meetings between the European and Asian partners, but Senard’s trip this week will mark the first time discussions have taken place in Japan. “We want to build mutual trust and good communications,” Nissan CEO Saikawa said during a media briefing at Nissan headquarters in Yokohama on Monday. Ghosn’s arrest ended what many insiders have described as an iron-fisted rule over all three of the alliance’s members. It also appears to put at least a temporary halt to a push by Ghosn – and backed by the French government – to more completely merge Renault and Nissan. 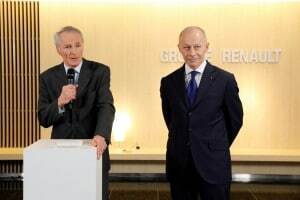 New Renault Chairman Jean-Dominique Senard, left, traveled to Japan to meet with his counterparts at Nissan. But while Saikawa has staked out a more autonomous relationship since Ghosn’s arrest, industry observers expect him to try to lay out a new approach that could continue to have Renault and Nissan, as well as Mitsubishi, work together. The Nissan CEO’s tenure is expected to be short. He last month announced plans to step aside, though Saikawa did not lay out a timeline and it is unclear how far a search for his successor has so far gone. The Ghosn scandal continues to weigh heavily on all three partners in the alliance at a time when they are facing a variety of problems. For Nissan, that includes a sharp downturn in its business in the key U.S. and Chinese markets it heavily relies upon. U.S. sales for the full fiscal year are expected to slip 8.6%, to 1.46 million vehicles, while Chinese sales will come in at an estimated 1.56 million vehicles. The original target was 1.70 million. Worldwide, Nissan expects to sell 5.6 million vehicles through the end of March, off from its original target of 5.93 million. This entry was posted on Tuesday, February 12th, 2019 at and is filed under Asia Pacific, Automakers, Automobiles, Business, China, Earnings, Europe, Executives, Financials, Lawsuits/Legal, Markets, NAFTA, Nissan, Personalities, Sales, South America, Trends, U.S./North America. You can follow any responses to this entry through the RSS 2.0 feed. Both comments and pings are currently closed. If nissan and mitsubishi were gone? Who would care? At least the roads would be a lot prettier NOT having those hideous designed brands in America. “The Ghosn scandal continues to weigh heavily on all three partners…”. This is now sounding like the buying public is actually taking their business elsewhere due to the treatment of Ghosn. Am I reading (into) that correctly?